I bought a new ironing board cover and iron shoe from Bo-Nash at the Wisconsin Quilt Festival. Just so you know, this is not a paid advertisement. I am in no way affiliated with the company. I just want to review this product. My ironing board cover had needed replacing for a while. It was stained from years of use, and it slipped when I ironed large pieces of fabric because it was stretched out. I was planning to make a new one because I don’t like the store ones. Also, my ironing board is larger than most modern boards. I bought the monster from an estate sale, the source of many of my favorite household items. When I saw the sweet Bo-Nash huckster at the quilt show, I was impressed. She ironed a variety of wrinkly items, explaining that the silver nonstick cover, made from the same stuff as firemen’s suits, reflected the heat back up through the fabric. What caught my eye was the fact that the cover adheres to the board, keeping it from slipping. I bought the regular size, which came with a foam pad. I cut the foam pad to fit, then carefully adhered the cover to the end of the board, smoothing it as I peeled the paper away and clipping the corners so that they would fit the sides and undersides of the board. It just fit my oversized board. The installation was time consuming, but not difficult. It works great! Ironing goes faster, is more effective, and is easier because the fabric is easily pulled over the board for repositioning. 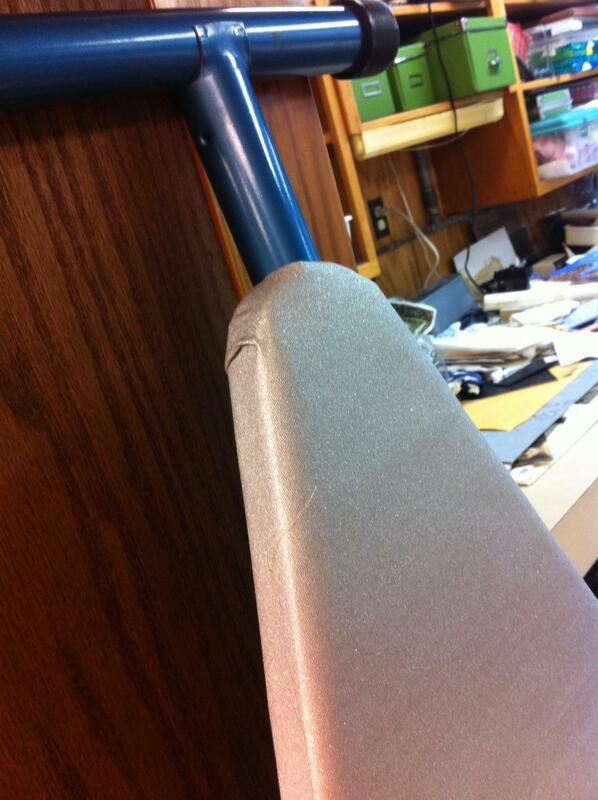 The cover does not slip or sag, and the pad is just soft enough to maintain optimal contact with the iron. The iron shoe… Well, I’ll save that for another day. This entry was posted in studio and tagged bo-nash, Clothing, Crafts, Home and Garden, Iron, ironing board cover, Laundry, review, Shopping, studio, Textile, tools. Bookmark the permalink. Very interesting. I think the silver non stick cover will really work fine. I agree. Great discovery. That would make ironing a lot easier. Of all things I need to do at home, ironing is my least favorite, but maybe if I’ll be able to use the same thing, it won’t give me such a hard time. Thanks for sharing. Such a great find. Thanks! Thanks for the comment, Yvett. The Bo-Nash saleswoman said that you can iron pants all in one go, without having to iron each side of the pant leg at a time because the steam and heat reflect from the cover, effectively ironing both layers of fabric at the same time. I bought mine at a discount at the expo, but you can buy the regular size ironing board cover from the company for about $20. You can probably find it even cheaper elsewhere online. I don’t know which stores carry it. In my limited experience, it is worth it. Ironing board covers have always been such a pain for me. I add padding, strap the sucker on, and still have sliding problems. This one is really terrific. I used it to iron several yards of fabric this weekend, and it was much easier than using the old ironing board cover. The ironing was more effective, and the fabric slid over the board when I wanted to use it, which made it much easier than the lift/place/smooth/adjust ironing board cover routine. Here is their website, so you can read a full description of the product.